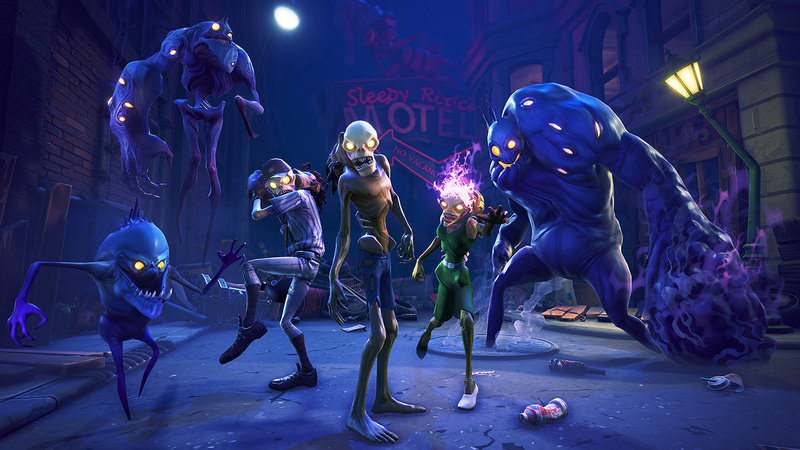 While the wait might have been nuts as this game was first announced in 2014, I’ve been impressed by the initial release of Epic Games’ new and original IP, Fortnite (a zombie survival/crafting game). It isn’t perfect, and I’m a little uncomfortable with the idea of a paid beta, but it’s a really well-made experience as it is now. Developer Epic Games didn’t invent the idea of horde-mode multiplayer, but they certainly defined it with Gears of War 2’s interpretation of the multiplayer feature back in 2008; I can’t think of another developer who I’d associate with the concept. 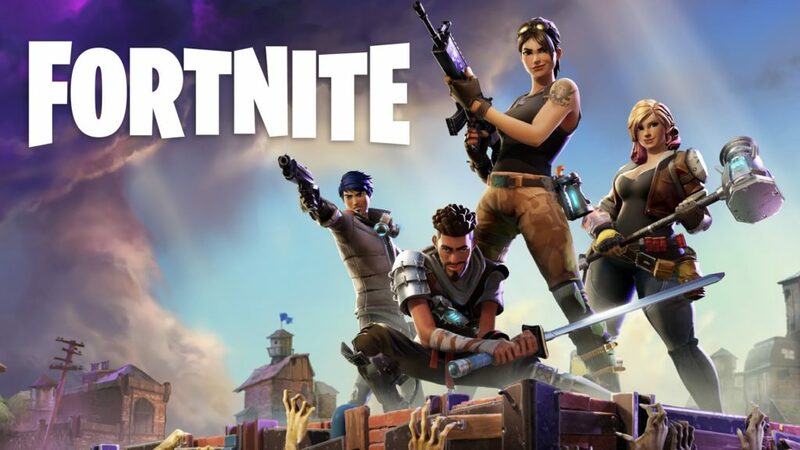 Fortnite is the ultimate example of that idea, outshining the creativity and depth of any other iteration of a “horde” game I’ve ever played. By and large, a horde mode is a simple concept, pitting a player or a number of players against incoming waves of AI controlled enemies, often with some way of setting up defenses. They’re usually a fun distractor or addition to a full game, but Fortnite attempts to make it the main presentation. Amazingly, it works thanks to incredibly intuitive and expansive means to build your defenses. Fortnite drops the player into a post zombie-apocalypse as seen through the lens of Pixar where the player and up to three friends (or random match-made partners) explore and acquire resources before signing up for the real fight. Amazingly, the entire world (street signs, cars, trees, and entire houses from roof shingles to basement walls) can be dismantled for building materials to construct your perfect base. I’m honestly amazed at how malleable the world — it isn’t made up of repeated blocks and obviously destructible objects, but the player can simply take more or less anything save for the earth itself apart. Different sources yield different resources, as mining rewards not only building materials (wood, stone, metal, and plastic) but also useful items. It’s all fairly impressive and feels like the sort of next-gen feature we’d have expected to be blown away by a few years ago, especially given the game’s aesthetic being far more polished than similar crafting games. It’s doubly impressive considering how large and open each area is, acting like miniature sandboxes that we can salvage down to the last nut and bolt. The building materials you glean from the world can, of course, be put to use — for building a fort (heh) to protect you against the night (heh heh) of terrors. The building system is amazingly well implemented, avoiding potentially clunky design with a stunningly seamless system of switching between combat, mining, and building modes. At the tap of a button, the player can switch between different modes instantly, and when in building mode, switching between walls, flooring, doors, stairs, and more can all be done straight from where the player is standing without the need to dive into a menu. This makes it remarkably useful not just for building your fort, but also as a new means of exploring. See an out of reach item on the roof of a building with no stairs? Make some. It’s as easy as a few taps and you’re already on your way. Building almost immediately becomes second nature, an extension of the player’s tool set as obvious as shooting a weapon or jumping from a platform. 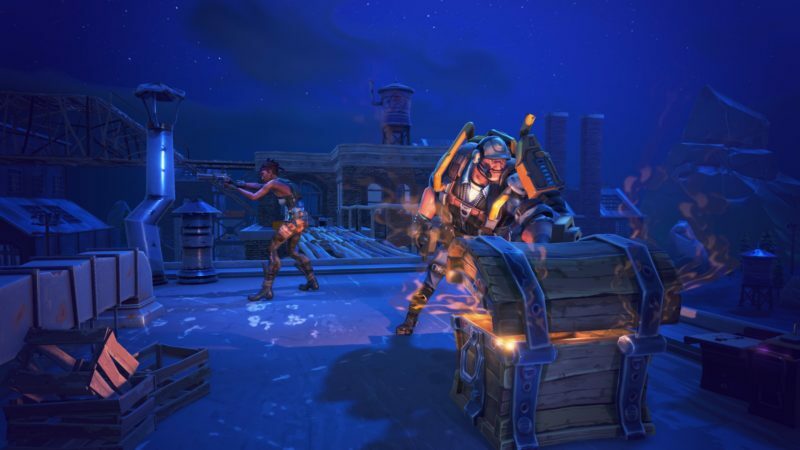 Skilled players can use the building and crafting system in a variety of surprising ways, and can ultimately bend the world of Fortnite to their will with a deeper grasp of the crafting mechanics. In a way, it’s so well implemented and designed that it leaves the other more general game features feeling dull in comparison. After completing your fort, the player begins a standoff with waves of zombies that are called forth from a dark storm that has decimated the world. The player can choose any of a number of class-based characters to control during a mission, each with their individual special perks and abilities. I opted for Ramirez, the Aliens’ Vasquez-like Commando character, which comes with grenades and a more balanced combat set up, although there are a variety of other types — Ninjas, heavies, and more. You can then fully customize your arsenal through dozens — maybe hundreds — of crafted weapons. Anything from simple handguns and rocket launchers, to katanas and broadswords are available. Each one handles uniquely with different stats and capacity for destruction, and the ammo for your weapons themselves can be constructed on the fly just as easily as anything else in the game. Unfortunately, combat in Fortnite is incredibly weak. I’d argue that it’s ultimately the least fun or interesting aspect of the game. By and large, especially in a well-coordinated group of friends, the zombies pose little to no threat whatsoever. Despite multiple variations and classes, these mutations are staggered at too slow of a pace ever to feel a real challenge, which results in Combat lacking variety and punch. Many of the creatures spawn so far away that equipping a sniper rifle and a grenade launcher is really all that one needs. If you use your resources wisely, the undead will literally never even get close enough to your fort to so much as fart on it. At best, combat feels like any other third person shooter. It’s difficult to feel engaged when combat itself is the bit in the way of going back to crafting, not the other way around. I will say that even with how dull combat can be, the world and characters are amazingly charming and funny. It’s the same sort of dorky/hipster humor that made me cringe in Sunset Overdrive, but it feels nicely restrained and well timed here. Ray especially shines as the player’s robot micro-manager who tasks you with missions and gives updates on the “story,” such as it is — a largely disconnected series of scenes about what caused the zombie storm and how to reverse it. Animation and detail in Fortnite is stunning, bringing the world to life like an animated feature presentation that is simply delicious to look at. It makes me even more annoyed at the poor and blurry transition Blizzard’s similarly cartoony Overwatch made to consoles, as Fortnite is sharp and crisp in a way that feels properly high-end. With all that said, Fortnite suffers a number of marketing side setbacks, not the least of which is its price tag. As previously stated, the game is still technically in a Beta state and will receive a full, free-to-play launch next year. Despite this, the Beta version of the game is actually paid, ranging from a budget $39.99 to a ridiculous $179.99 version. Each iteration contains special bonuses, perks, and an allotment of special loot depending on which version purchased, but the keyword here is purchased. 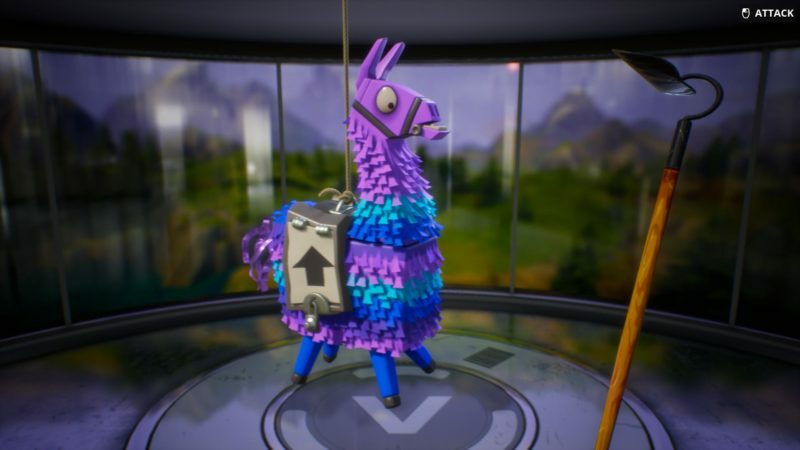 Despite not having gone free-to-play yet, all of the game’s free-to-play elements are still very much present — from loot boxes (presented as talking llama pinatas which are honestly a little disturbing [having to whack something apart as it talks to you and swivels its eyes around feels… wrong]) to a very unwelcome in-game currency system. The number of points needed to rack up towards one of these loot boxes might feel about right once the game is free-to-play, but as a customer who spent potentially more than the standard $60 price tag, the loot box system is unwelcome. It’s a gross-feeling addition to an experience that is already trying to market itself with what most games would consider a supplementary mode. Fortnite is a very well crafted rendition of horde mode, don’t get me wrong. In a climate where more and more games deliver half experiences for full price or more, though, the knowledge that players still have to deal with the limitations of a nonexistent free version in their paid copy is annoying and frankly greedy. The paying player is rewarded a pittance of loot boxes and other small bonuses for purchasing what the game calls the “Founder’s Edition,” but as you get closer to end-game type material, the omnipresence of the game’s free-to-play design becomes more and more of a hindrance. Your experience is currently a Fee-To-Pay one, Fortnite, and that’s not cool. As it stands, the knowledge that the game will eventually go free-to-play gives me pause in wholly recommending a purchase of any one of the versions currently available. I remain impressed by a lot of the game has to offer — the simple and unique crafting system and charming and lovable world Epic has devised — but it’s deeply undercut by both the early free-to-play elements already implemented, in addition to the lackluster depth of the core horde-based gameplay. Fortnite offers a lot of fun, but I highly recommend waiting for more information regarding the upcoming free-to-play release. 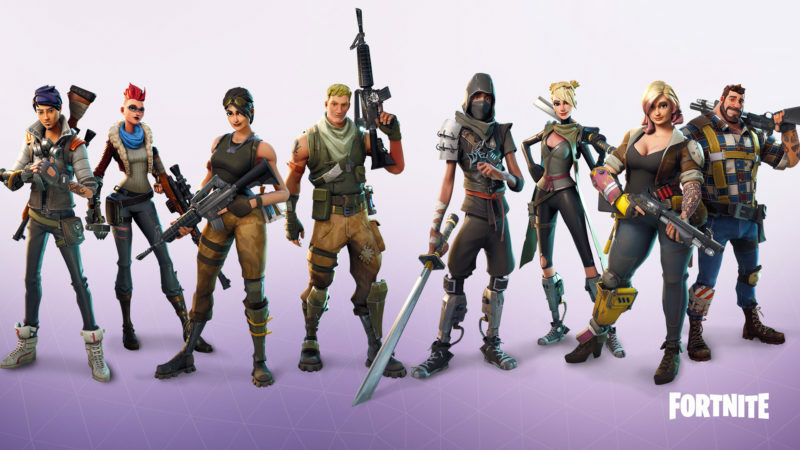 Collectively we should watch and wait to see how Fortnite changes over time. As of now, it shambles in a few too many ways.